In what had to have been one of the more highly anticipated hip-hop shows booked in to Madison this spring (JPEGmafia notwithstanding) Doomtree member/founder P.O.S. [born Stefon Alexander] brought his socially conscious raps to the High Noon Saloon on a balmy Tuesday night, May the 15. P.O.S. and D.J. Rowsheen had arrived in Madison several hours earlier for a well attended and inspirational warm up set in the downtown Isthmus magazine offices. Former Madison and current Minneapolis artist CRASHprez kick-started the High Noon show with an emotional and energetic set that captivated everyone who had the good sense to come out early. The High Noon was gradually filling in during both CRASHprez and the evening’s second performer, Serengeti, from Illinois. With his thick glasses, wool cap, and dry sense of humor, Serengeti also won over the audience, especially with his rap about onions, that featured the utterance “onion” over, and over, and over… almost in to infinity. It was pretty hilarious, actually. P.O.S. was on the final date of a short tour, traveling with fellow Minnesotan D.J. Rowsheen, who programs his beats and spins platters with samples and scratches, as the backdrop to the P.O.S. wordplay. Tonight the set’s intro slow-burned with D.J. Rowsheen laying down the groove, but finding P.O.S. reluctant to start the rap, instead just playfully talking to the crowd and generally getting settled in and intimate. There were several “false starts” until the raps ignited on “F*ck Your Stuff”, and the pumped-up audience immediately was shouting / rhyming along to every single word. As the night went on, the venue got more packed in, until, as P.O.S. himself noted, “Madison filled it up on a Tuesday night”. 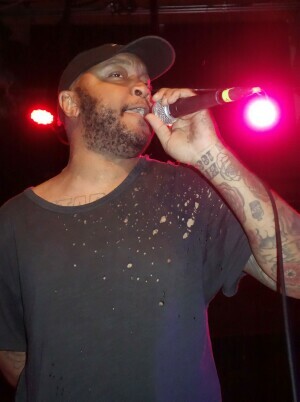 Most of the crowd pushed up to the front of the stage to feed off of the rapper’s energy on incendiary songs like “Lock Picks, Knives, Bricks, and Bats”, from 2013’s ‘We Don’t Even Live Here’. Several songs from the most recent P.O.S. album, the fan favorite and critical smash ‘Chill Dummy’, were performed to fevered enthusiasm. Some highlights included “Lanes”, with its borderline emo college-rock musical song structure, and which was presented to captivating effect early in this set. “Wearing A Bear” was met with an ecstatic reception, as this composition showcased a tight upbeat groove, and aggressive staccato raps with lyrics taking on racism’s truths and myths. “Pieces / Ruins”, was more akin to a lush jazzy dreamscape with slightly subdued and introspective autobiographical poetic raps. P.O.S. wound up the main portion of his set with “Faded”, which had a funny prelude as P.O.S.’s playful goof singing (sort of like / not like) Justin Vernon’s (Bon Iver) vocal part from the “Chill Dummy’ record. Just like at the Isthmus session earlier that day, “Faded” was both encouraged and enhanced by a huge sing-along chorus that often was exclusively audience. Coming back for a few encores, P.O.S. invited CRASHprez to join himself and D.J. Rowsheen for a massive stomper which had everyone jumping around and going bonkers, both on stage and off. “Sleepdrone / Superposition”, the evening’s final encore, left a more unifying and positive message for the audience to take home with them. In summation, this was by far one of the best shows I have seen this year, and I don’t just mean hip-hop, I mean of ANY shows. P.O.S. is a sincere individual and you can tell he cares about the people he interacts with. Let’s hope we see a lot more P.O.S. in Madison in the very near future.